The tender, slippery texture of this seafood, while sometimes the main reason to put people off, makes pulpo a la gallega one of my favorite Spanish plates. 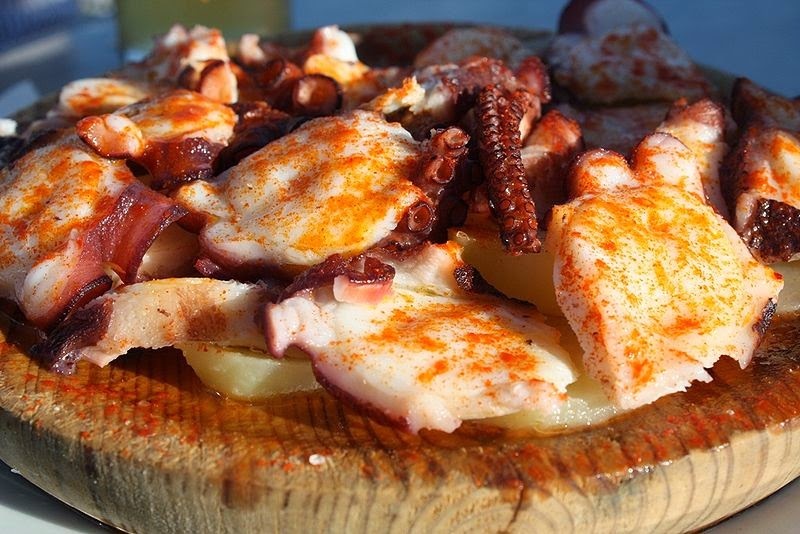 Unlike the states, octopus is quite a popular order in Spain, and is Galicia's (Northwestern Spain) signature dish thanks to its extensive coastline. It used to be most commonly sold at fairs, hence one of the names of the dish. The octopus is usually boiled in salted water, sometimes with sherry, lemon or garlic, although I have also seen it sauteed or grilled. It is then covered with a good olive oil and powered with smokey pimentón (Spanish paprika) and sea salt- which surprisingly does not overwhelm the mild taste of the octopus. Traditionally pulpo is served on a wooden plate and often accompanied with bread or boiled potatoes. However simple the plate may sound, preparation is the key to its goodness. Timing is everything. To ensure just the right texture, small details like making sure the octopi are boiled in copper pots, dipping the tentacles in first so they curl nicely and allowing a resting period after boiling, before slicing the pulpo with scissors, make this dish what it is. If you're in Spain, this plate is a must-try!